I had such a good experience with the SpectraLock expoxy grout that I used to grout my bathroom floors, that decided to use it for all the walls as well. This time I chose the “bright white” color. 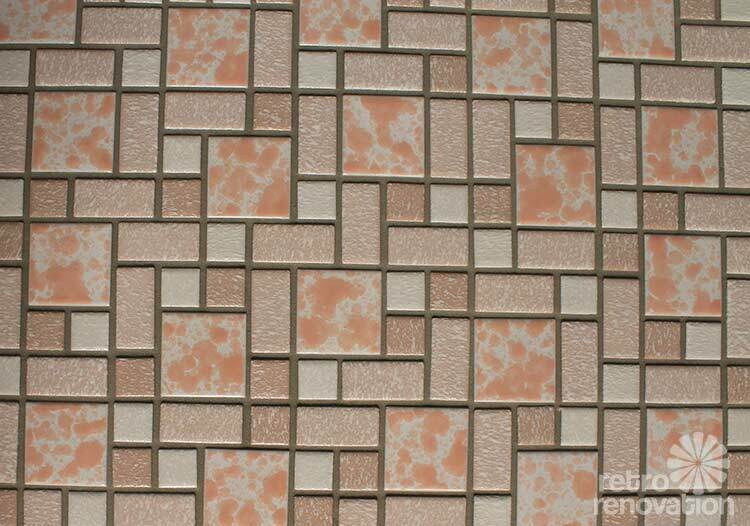 Grouting vertical tile joints is much more difficult than working on a horizontal surface. Your biggest foe will be gravity. Since my floor was finished, I covered it with protective paper and taped it down to ensure no grout from the walls got on the finished floor. Even if you do your walls first and floor second, it is still a good idea to put down paper or tarps to catch all the grout that falls off the float when grouting. 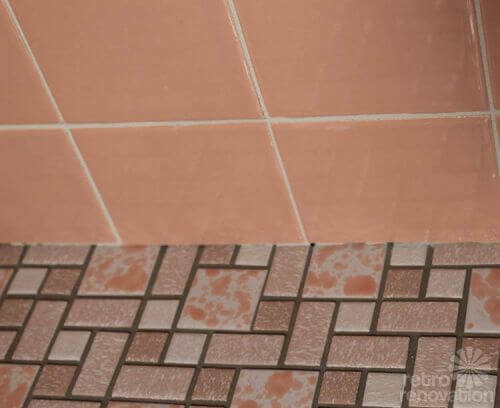 Once this epoxy grout dries on a surface, it is difficult to remove. 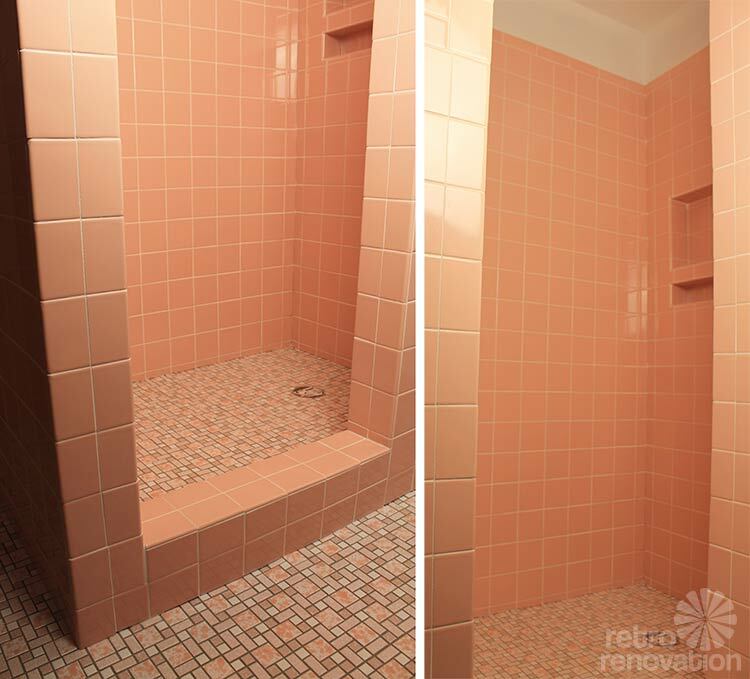 The instructions on the SpectraLock container say that use with narrow or vertical joints can leave out up to 10% of the color mixture to make the grout easier to apply. I forgot this when mixing up the first batch, and it was extremely difficult to get into the tile joints. For subsequent batches, I left out about 8-10% of the part C colorant, which helped immensely. Starting on the inside of the shower and working my way around the room took me about three solid days, spread over two weekends. If I thought grouting the floor was a workout, grouting the walls was like total body bootcamp. It took a lot of strength to force the grout into all of those small 1/16 vertical joints — from the tippy top of the shower down to the floor. Let’s just say, my arms feel sore just thinking about it. In the end, the walls look amazing. 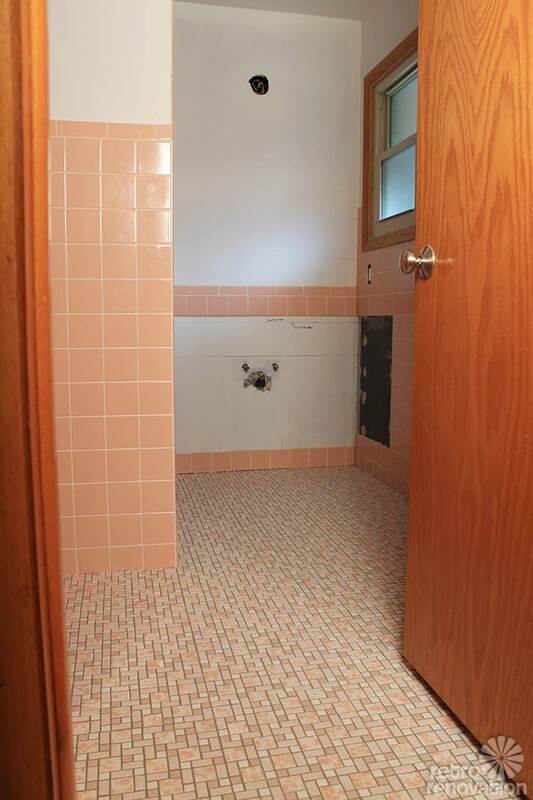 Up next is the last step to finish off the tile — caulk. The inside corners of all the walls, joints where the floor and wall meet, and the top edge of the bullnose tile are all in need of some caulking. 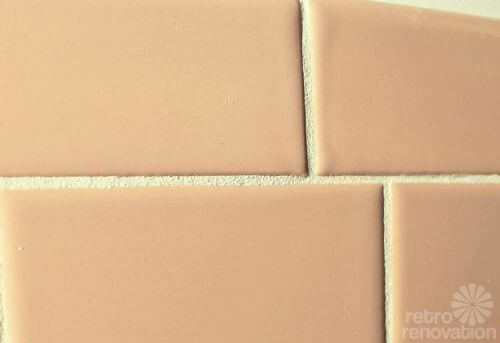 It is important to caulk the corners instead of grouting them because caulk allows for slight movement in these areas. Grout applied to corners will likely crack over time. Oh my gosh, this is my parent bathroom!!!! My parents had lived their 40yr and since my dad stroke 7yrs ago, lives with me part-time. I have been looking “what to do with THAT pink bathroom” for a few years. I too have decided to embrace it. The smaller bathroom too it also has pink everything except a grey tub, toilet and drop in sink. 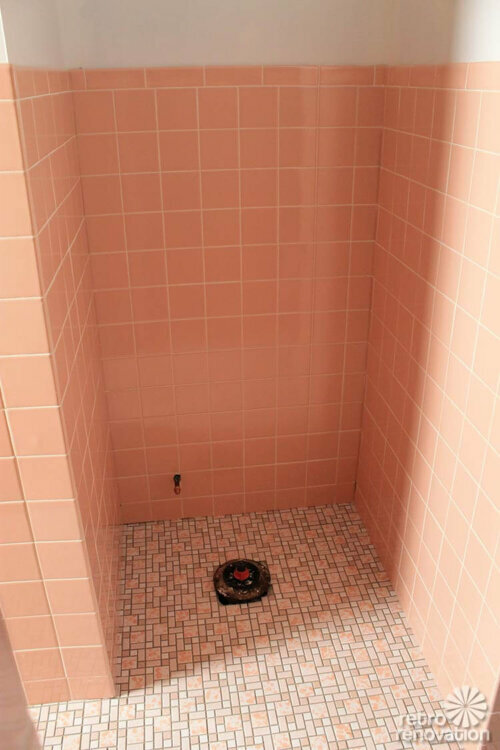 Can you please give an update on how this grout has performed? 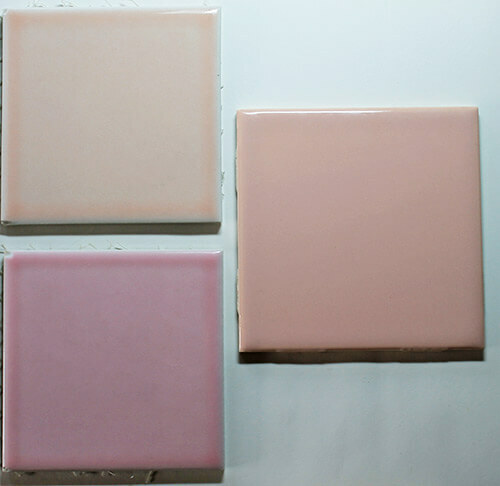 I was thinking about it for our white tile and was told on a tile forum that the white epoxy grout can yellow from the resin. That has me worried! I am having a hard time determining the right grout for our tiling…I could go with a very light grey but really wanted the look of the white on white. Hello we installed the same merola tile but in blue in our 1958 bathroom. But after a couple of months the blue is rubbing off the tile. Is anyone else having this problem? 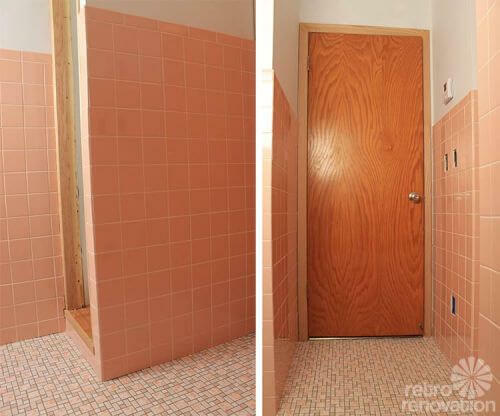 We bought the same tile for our other bathroom in another color. But now very worried this issue is going to get worse or do the same with other color.Any advise? 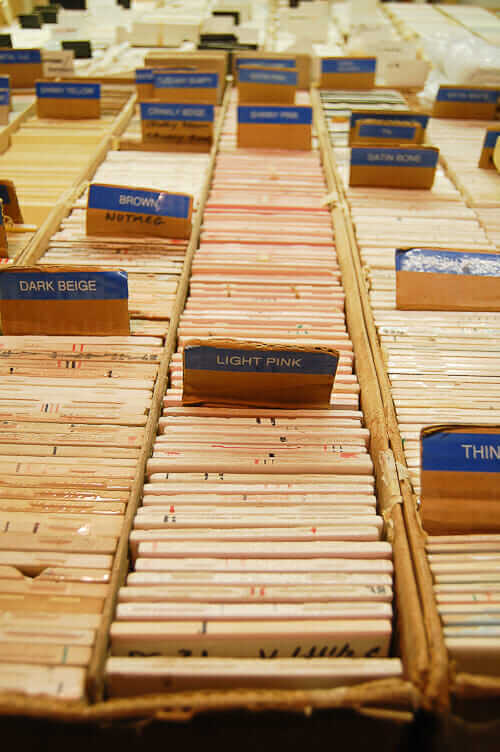 Melanie: I think that numerous readers — including Kate, who worked for me for four years — have installed this tile, and I don’t recall that I have ever heard of this issue occurring with them. I called Merola just now, and connected with their Marketing department. They say you also contacted them (the same time that you made this comment), and they have replied back to you via email to connect. They sound like they want to get to the bottom of any issue — so look for their reply email! Good luck! I did see the email from from marketing when I got home from work today. I’m going to take pictures in the morning when I have the best lighting and foward. I did speak to some one in customer service from Merola Tile website but he wasn’t very helpful. Although he was the only one left in the office at the time so I will also try back on Monday. Keep you posted on with both marketing and customer service. Hope we can resolve this issue. Eventually would love to send you photos of our work we put in to restore our 1958 home. Thank you for your help and contacting Merola as well. Finally able to provide an update. Sorry for the delay. Elizabeth at Merola Tile was very helpful and responsive. I sent her photos. Turned out to be grout hazing. Phew!!! I purchased the hazing cleaner on amazon. Took longer to arrive then expected and then we had our 2 years old birthday party. But this weekend we finally got a chance to put in some work. With great results!!!!! It’s gone from nearly all the tile. There is a very tiny amount left in the worst pieces but unless you knew where to look it would not be noticed. This was a huge relief not to be an issue with the tile. I would like to thank you as well for your assistance in contacting Merola tile also. 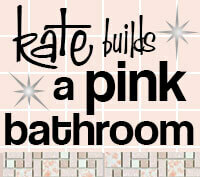 Hope to get started in our other bathroom soon and complete the blue bathrooms restorations as well.